EMA has labeled this new category of capabilities “Transformational Analytics,” reporting that the sophisticated algorithms used in X-Act place it in an advantaged position vis-à-vis other, more operations-centric analytic tools that typically rely more on statistics. 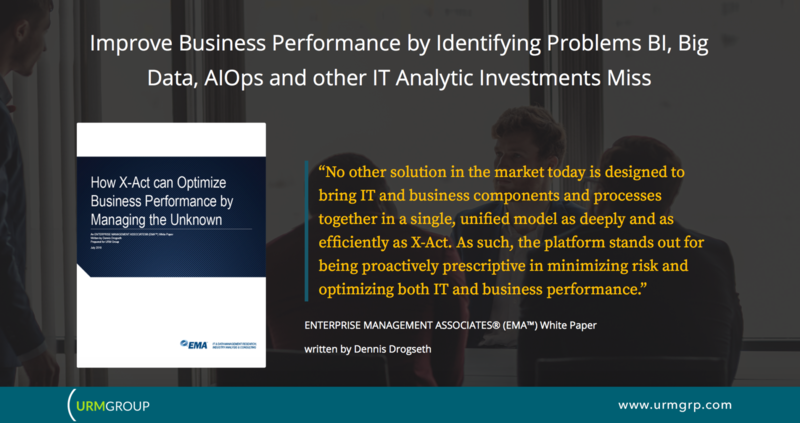 Download ENTERPRISE MANAGEMENT ASSOCIATES® (EMA™) White Paper, How X-Act can Optimize Business Performance by Managing the Unknown at https://urmgrp.com/portfolio-item/ema-urm-xact/. “I do not believe that there is any other solution in the market that offers a single consistent model for business processes and the application/infrastructure when you seek to optimize both effectively. Only X-Act does that, and it does so with unique levels of accuracy,” Head of Infrastructure Operations at a global Financial Services Company said. “X-Act tells you where the problems are, where they are likely to materialize in the future, and how planned changes on all fronts may affect the outcome one way or another. This makes investments in new resources, if they’re needed, a fact-based discussion with a clear business context. Not surprisingly, this is one of the reasons for IT executive enthusiasm.” IT Architect, Large European Bank said. Learn more about X-Act platform at https://urmgrp.com/technology/. URM GROUP provides the technology and services many of the world’s most recognizable brands depend on to optimize opportunities and comprehensively control risks across diverse business and IT systems. With patented generative intelligence technology, X-Act® platform provides a revolutionary way to quickly and predictively pinpoint hidden sources of risk within business ecosystems and know which actions should be taken to meet business goals. Leaders across financial services, retail, manufacturing, transportation, healthcare and governments trust X-Act to make informed decisions relating to a wide range of strategic objectives—from digital transformation, cost management, mergers and acquisitions to supply chain management and production performance. For additional information, visit https://URMgrp.com or connect with us on Twitter @URMgroup. 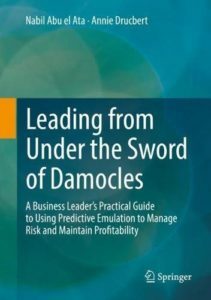 Dr. Nabil Abu el Ata, URM founder, business technologist and author, has just released his latest book, Leading from Under the Sword of Damocles: A Business Leader’s Practical Guide to Using Predictive Emulation to Manage Risk and Maintain Profitability. Dr. Abu el Ata jointly authored the book with Annie Drucbert, URM co-founder and technology strategist, to explain how businesses are using universal risk management (URM) breakthroughs to outperform competitors, achieve higher profits and sustain growth. Globalization trends and the rapid pace of technological innovations have introduced unprecedented change and uncertainty. To thrive under these conditions, companies must adopt new risk management practices and technologies to better anticipate and adjust to risks caused by the hyper connectivity of our modern world. Leading from Under the Sword of Damocles helps readers understand how new algorithm-based predictive and prescriptive analytics technologies are being used to control risk and maximize opportunities in today’s dynamic business environment. Case studies show how the presented URM methods have been practically applied to preemptively expose risks and support decisions to optimize, transform or disrupt current business models, strategies, organizational structure and information technology (IT) systems when necessary to maintain a market position or outperform competitors. Leading from Under the Sword of Damocles is 233 pages, published by Springer, and available in both print and e-book through online book sellers including Amazon.com and Springer. To learn more about the practice of universal risk management and the technological breakthroughs that support improved business performance, visit: http://URMgrp.com. Nabil Abu el Ata has invested over 20 years maturing the science of risk management and the practical application of predictive analytics technologies. In the late 1970s Dr. Abu el Ata’s mathematical discoveries provided accurate coordinates for space exploration. By solving a problem that was previously defined as unsolvable, Dr. Abu el Ata set the foundation for a new era of risk management, which today enables companies worldwide to more accurately predict future system behaviors and take strategic actions to improve business outcomes. Annie Drucbert is a co-founder of URM GROUP and a recognized authority in the predictive and prescriptive analysis of economic, financial and enterprise systems. Mrs. Drucbert’s specialties include modeling, emulation and performance management of complex database and corporate systems. Mrs. Drucbert holds 3 US patents and has delivered strategic, tactical and operational services using X-Act OBC Platform for many global clients. The URM Forum, which will serve a global community of experts and practitioners who are committed to developing a more scientific, cross domain approach to identifying and managing operational risks that increasingly threaten business performance due to the dynamic complexity of our modern world, launched today. Current operational risk management practices are placing businesses in jeopardy. As our world becomes more dynamically complex, the opportunity to take corrective actions is shrinking, while risks are rising. Traditional risk management practices and technologies can no longer provide leaders with the insights they need to navigate the uncertainty and exponential change being driven by the Fourth Industrial Revolution. URM Forum will support a collaborative global network of individual thought leaders who are committed to working across industry and government segments to identify new operational risk management solutions that are vendor neutral and non-competitive in nature. Founding members include executive and technology leaders from Accretive, IBM, Deutsche Bank, BNP Paribas, La Poste, Morgan Stanley, CLS Services and federal government. URM Forum members must be invited and qualify based on their ability to contribute towards a meaningful solution, which is part of what makes this forum unique and our work impactful. Executive, technology, academia and governmental leaders interested in joining URM Forum are encouraged to apply at https://urmgrp.com/urm-forum/join-urm-forum/. Omaha, NE—May 18, 2016–Accretive Technologies, Inc. (Accretive) announces the release of a new book, “The Tyranny of Uncertainty.” Accretive Founder and CEO, Dr. Nabil Abu el Ata, jointly authored the book with Rudolf Schmandt, Head of EMEA and Retail production for Deutsche Bank and Postbank Systems board member, to expose how dynamic complexity creates business risks and present a practical solution. The Tyranny of Uncertainty explains why traditional risk management methods can no longer prepare stakeholders to act at the right time to avoid or contain risks such as the Fukushima Daiichi Nuclear Disaster, the 2007-2008 Financial Crisis, or Obamacare’s Website Launch Failure. By applying scientific discoveries and mathematically advanced methods of predictive analytics, the book demonstrates how business and information technology decision makers have used the presented methods to reveal previously unknown risks and take action to optimally manage risk. Further, the book explains the widening impact of dynamic complexity on business, government, healthcare, environmental and economic systems and forewarns readers that we will be entering an era chronic crisis if the appropriate steps are not taken to modernize risk management practices. The presented risk management problems and solutions are based upon Dr. Abu el Ata’s and Mr. Schmandt’s decades of practical experience, scientific research, and positive results achieved during early stage adoption of the presented innovations by hundreds of global organizations. 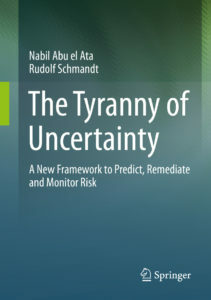 The book is available to order on amazon.com at https://www.amazon.com/Tyranny-Uncertainty-Framework-Predict-Remediate/dp/3662491036/ref=sr_1_1. The methodologies and innovations presented in this book by Dr. Abu El Ata and Mr. Schmandt are now in various stages of adoption with over 350 businesses worldwide and the results have been very positive. Businesses use the proposed innovations and methodologies to evaluate new business models, identify the root cause of risk, re-architect systems to meet business objectives, identify opportunities for millions of dollars of cost savings and much more. Accretive Technologies, Inc. offers highly accurate predictive and prescriptive business analytic capabilities to help organizations thrive in the face of increasing pressures to innovate, contain costs and grow. By leveraging the power of Accretive’s smart analytics platform and advisory services, global leaders in financial, telecommunications, retail, entertainment, services and government markets gain the foresight they need to make smart transformation decisions and maximize the performance of organizations, processes and infrastructure. Founded in 2003 with headquarters in New York, NY and offices in Omaha, NE and Paris, France, Accretive is a privately owned company with over 350 customers worldwide. For more information, please visit http://www.acrtek.com.